Gratitude from Soroti over more new wells! With the generous support from Teso Development Trust (TDT) UK, over 523 households have been provided with safe and clean water. 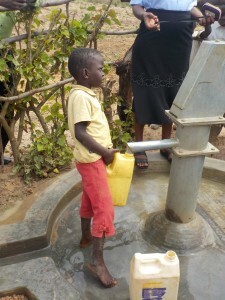 In Uganda, an average household has 7 members implying that over 3,670,000 people benefited from the 8 completed wells. •A significant reduction in the incidences of the water borne diseases as evidenced by the available statistics in the nearby health centres (70% reduction). •Visible improvement in hygiene and sanitation situations owing to the complementary sanitation facility coverage that was handled concurrently with the shallow wells program especially at the sensitization stage. •Most of the villages engaged with have been intermittently declared Open- Defaecation Free(ODF). The support by TDT, UK through PAG-MDD, Soroti continues to touch and impact lives positively both qualitatively and numerically.